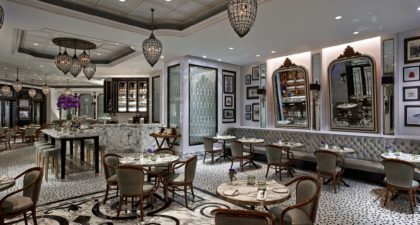 Located on the ground floor of the Ritz-Carlton in Cotai, the Ritz-Carlton Café is a French brasserie where you can experience the country’s classic café culture. Combining charming décor and flavourful food, the Ritz-Carlton Café is among the restaurants recommended in the Michelin Guide for Hong Kong and Macau (2017), as well as, ‘Macau’s Best Café’ as touted by Hong Kong Tatler (2017). The menus are wide and variety, featuring different options for à la carte breakfast, à la carte lunch, dinner set or à la carte, cakes and more. The café also hosts to live music performances on occasion. Online reservations available, or reserve by email. Guest should note that reservations are not applicable for afternoon tea on weekend or holidays.